The Pembroke Welsh Corgi descends from a crossbreeding of the Cardigan Welsh Corgi with either the Schipperke and Pomeranian or the Swedish Vallhund, which travelled to Wales with the Vikings. It is the smallest herding breed. ‘Cor gi’ translates to ‘dwarf dog’ or ‘gathering dog’ in Welsh; the rest of the Pembroke Welsh Corgi’s name comes from its birthplace of Pembrokeshire, Wales. Originally used as a hunter and guard dog, the Pembroke Welsh Corgi was later trained to herd cattle and sheep. 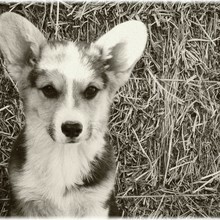 The Pembroke Welsh Corgi was not used as a show dog until the 1920’s, and then met with only mild success. It was recognized as a distinct breed from the Cardigan Welsh Corgi in 1934, which led to a gradual increase in popularity. By 2006 the Pembroke Welsh Corgi had become the 22nd most registered breed with the American Kennel Club, far outnumbering the Cardigan variety. Famous Pembroke Welsh Corgis include ‘Ein’, the genius dog from anime ‘Cowboy Bebop’, and Stephen King's Pembroke Welsh Corgi ‘Marlowe’, who ‘Oy’ from ‘The Dark Tower’ series is based on. The Pembroke Welsh Corgi is also highly popular with British royalty; Queen Elizabeth II reportedly has more than a dozen pet Pembrokes. The Pembroke Welsh Corgi is an energetic dog that bonds quickly with its family. It is brave, intelligent, alert, and self-confident. The Pembroke Welsh Corgi is slightly less aggressive and less boisterous than the Cardigan Welsh Corgi. It barks occasionally and makes a good watchdog. The Pembroke Welsh Corgi is an energetic dog that bonds quickly with its family. It is brave, intelligent, alert, and self-confident. The Pembroke Welsh Corgi is slightly less aggressive and less boisterous than the Cardigan Welsh Corgi. It barks occasionally and makes a good watchdog. Pembroke Welsh Corgis are good with children as long as they are respected; some tend to nip at the heels. Pembrokes can get along well with cats and other pets if socialized when young, but may not be fond of other dogs. The Pembroke Welsh Corgi is somewhat suspicious around strangers and must be trained not to growl. Pembroke Welsh Corgis can be domineering over one another. You can find Pembroke Welsh Corgi puppies priced from $150 USD to $4500 USD with one of our credible breeders. Browse through our breeder's listings and find your perfect puppy at the perfect price. Pembroke Welsh Corgi Puppies for Sale - Shipped Worldwide! Finding the right Pembroke Welsh Corgi puppy can be dog gone hard work. PuppyFind® provides a convenient and efficient means of selecting and purchasing the perfect Pembroke Welsh Corgi puppy (or Pembroke Welsh Corgi puppies) from the comfort of your home, 24 hours a day, 7 days a week. Take advantage of our PuppySearch or leisurely browse our directory of hundreds of dog breeds, Pembroke Welsh Corgi dog breeders, Pembroke Welsh Corgi dogs for adoption, and Pembroke Welsh Corgi puppy for sale listings with photos and detailed descriptions. Some Pembroke Welsh Corgi puppies for sale may be shipped Worldwide and include crate and veterinarian checkup. Many Pembroke Welsh Corgi dog breeders with puppies for sale also offer a health guarantee. With thousands of Pembroke Welsh Corgi puppies for sale and hundreds of Pembroke Welsh Corgi dog breeders, you're sure to find the perfect Pembroke Welsh Corgi puppy.